Preheat oven to 400-degrees. Spray four 4-oz ramekins with nonstick spray. Sprinkle 1 teaspoon of the sugar into one of the ramekins, rotating the cup to coat the bottom and side with sugar. Pour excess into the next cup and repeat until all cups have been coated. Place sugared ramekins into refrigerator until ready to use. To Make Creme Anglaise: Combine milk and cream in heavy medium saucepan. Scrape in seeds from vanilla bean; add bean. Bring milk mixture to simmer. Remove from heat. Whisk egg yolks and sugar in medium bowl to blend. Gradually whisk hot milk mixture into yolk mixture. Return creme to saucepan. Stir over low heat until mixture thickens and leaves path on back of spoon when finger is drawn across, about 5 minutes. Do not boil. Strain sauce into bowl. Set aside, or cover and chill to use later. 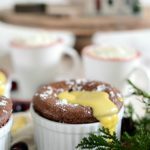 To Make Chocolate Souffle: Place semi-sweet chocolate chips and milk in medium microwaveable bowl. Microwave for 30 seconds, stirring at 10-second intervals until the chocolate is melted smooth. Whisk in 1 tablespoon sugar, the egg yolk and flour until blended and smooth. Set aside for about 6 minutes, until cooled. Beat the egg whites and cream of tartar in a medium bowl with an electric mixer on medium speed until soft peaks form, about 2 minutes. Sprinkle with 2 teaspoons of sugar and beat until soft, glossy peaks form, about 2 minutes more. Gently fold the whipped egg whites into the chocolate mixture. Spoon the chocolate mixture into the sugared ramekins. Place the filled cups onto a small baking sheet and place in preheated oven. Bake until puffed, about 12 to 15 minutes. Sprinkle with powdered sugar and drizzle a spoonful of creme anglaise on top if desired, and serve immediately.